At 3:30 a.m., on Sunday, June 22, 1941, three million German soldiers lashed out across the border. Their goal was to destroy the ill-prepared colossus that was the Soviet Union. Enormous gains were made at first; countless Soviet formations lay shattered or were simply made prisoners, and the war booty captured would forever keep the Reich supplied. But the finest army in the world was up against the largest army in the world in what both sides knew would be a fight to the death. The end result, after four years of war, was a Reich in ruins. Here lay the decisive front of WWII and it was here that War without Mercy was waged. 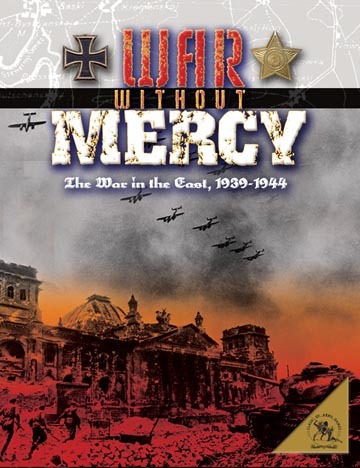 War Without Mercy showcases the true nature of fighting in the East Front from 1939-44. Crush Poland in a month in the training scenario. Against Russia, decide how many Panzer Korps and how much air support to allocate to each German ArmeeGruppe. War Without Mercy provides many opportunites for player decisions within the framework of a good strategic simulation and a playable game. Determine whether Leningrad, Moscow, or Kiev (or all three) will be the primary strategic objective for 1941. Choose where and when to counterattack the advancing Germans and where to unleash the Siberians. Ponder where to launch a 1942 German offensive. Plan on whether to hold back the Russian reserve in 1942 or attack the weak German sectors of the front. Discover whether you have what it takes to conquer Russia or the skill to stop the Germans and drive them back.